One of the best forms of R. degronianum ssp. 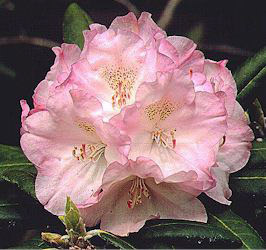 yakushimanum) with appealing foliage and richly-colored pink flowers. 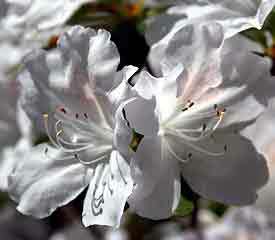 Flowers are funnel-shaped, 2½" across, held in trusses with 13 to 17 flowers. Blooms midseason. Leaves oblanceolate, re-curved, dark green with thick indumentum beneath. Compact, mounding plant habit. Grows twice as wide as high. Height: about 4 ft. in 10 years. Cold hardy to -15°F (-26°C). Selection received an Award of Excellence (1969). There is debate as to whether the plant is a variety of the species or is a hybrid containing R. smirnowii or another species. Selected by Janeck. 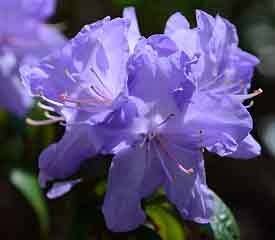 Flower light purple at edges shading lighter in throat, no markings, openly funnel-shaped, 1¾" across. Ball-shaped truss has 4-6 flowers. Blooms early midseason. Leaves elliptic, acute apex, cuneate base, convex, 2¾" to 3⅛" long, semi-glossy, moderate olive green. Open growth habit. Grows to a typical height of 5 ft. in 10 years. Plant and bud hardy to -15 °F (-26°C). Hybridized by Rhein. Flower white with very faint pink on lobe edges, light pink spotting on dorsal lobe, single, funnel-shaped, 3½" to 4½" across. Truss holds 2-3 flowers. Blooms early midseason. Leaves elliptic, cuneate base, acute apex, flat, light green. Spreading, broad, plant habit. A vigorous grower. Grows to a typical height of about 5 ft. in 10 years. Plant and bud hardy to at least 0°F (-18°C). Hybridized by Morrison. 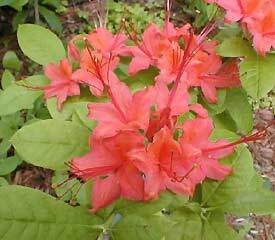 Flower orange to red, sometimes yellow, slightly fragrant, funnel-shaped, 1½" to 1¾" across Truss holds 3-7 flowers. Blooms late to very late. Leaves ovate or obovate to elliptic, up to 3" long, deciduous. Low shrub, often stoloniferous. Grows to 4 ft. tall in 10 years. Cold hardy to -15°F (-26°C). Native species found in the eastern United States on the Cumberland Plateau in Kentucky and Tennessee and on the mountains of Georgia, Alabama, and North Carolina. Photos (top to bottom) by Eleanor Philp, Don Hyatt, Don Hyatt, Sally and John Perkins.